Commissioners will require multiple sources of information to make decisions. The essence of good commissioning is the securing of the best possible services for the local population using the available resources. This requires a wide range of knowledge and the juggling of often competing priorities. This article reviews the considerations that commissioners must take into account in their planning, and the sources of information which they might use in doing this. A comparison of health outcomes at a local level reveals a vast amount of variation from the national average. This variation applies to almost any imaginable measure. For example, mortality from coronary heart disease in people aged under 75 years has an almost three-fold variation across England.5 If you need convincing, browse through the excellent NHS Atlas of Variation (www.rightcare.nhs.uk/atlas), which maps variation at a local level on dozens of outcomes. This variation means that local commissioners often want to prioritise services to meet local needs. These local priorities may be subtly (or even widely) different from the priorities observed from a national level, which average out this local variation. In recent years the Government, through the Department of Health (DH), has tried to align the priorities of local commissioners with the national priorities, by setting targets for improvements in particular processes (e.g. waiting times for cancer treatment) and through development of national ‘best practice’ guidance such as NICE guidelines or National Service Frameworks. A new approach is required in line with the Health and Social Care Act6 under which the DH will no longer set specific targets for treatments; instead, the NHS Outcomes Framework specifies the national outcomes for the NHS. 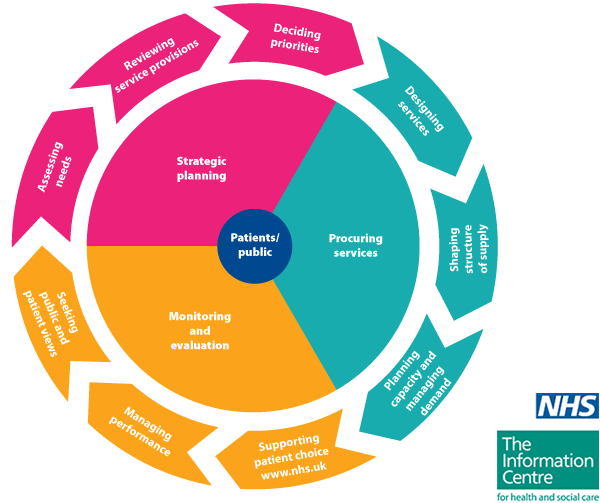 Within this framework, Outcomes Indicators are identified at clinical commissioning group (CCG) level.7 The Secretary of State now sets an NHS Mandate2 for the NHS Commissioning Board (NHSCB) detailing the required improvements in outcomes and service standards. Basic standards are embedded in the NHS Constitution,1 including waiting times for cancer and routine treatments. Figure 1 shows how NHS standards, outcomes metrics, and planning guidance flows through the new NHS structures. furthering economic growth, including supporting people with health conditions to remain in, or find work. Clinical commissioning groups are responsible for outcomes in their local health systems. For each CCG, a set of localised indicators will be identified, drawn from the NHS Outcomes Framework—the Clinical Commissioning Group Outcomes Indicator Set (formerly known as the Commissioning Outcomes Framework). In setting their strategic goals, CCGs will be required to set themselves aspirational improvement targets against their local indicators, which may be opened to challenge if the NHSCB believes they are not ambitious enough. choice of treatments including choice of hospital for elective surgery. The duty of commissioners to secure the best outcomes for the population they serve, within the resources available to them, is sometimes described as ‘value’,13 which equals health outcomes ÷ cost. This value is particularly important where there are inequalities in health outcomes. These may arise due to deprivation and social or demographic characteristics. In the current financial climate, where the rising costs of healthcare are likely to exceed the increases in funding for the foreseeable future, commissioners must strive ever harder to increase the value of health services. To achieve this, they will need to find common ground with other commissioners of public services, particularly social care. To improve the value of health services, commissioners must first identify the health needs of their population, which will allow them to prioritise their investment to reduce inequalities and maximise the gain in value. Contracts for commissioned services must be monitored to ensure that the outcomes and success expected for that investment are reviewed regularly in order to continually improve the process—this forms the ‘commissioning cycle’ (see Figure 3). Public involvement in planning and evaluation is crucial to ensuring a responsive service. The effective planning and monitoring of health services requires information and data that is timely, accurate, meaningful, relevant, recognisable, and reconcilable with other data (see Table 1). 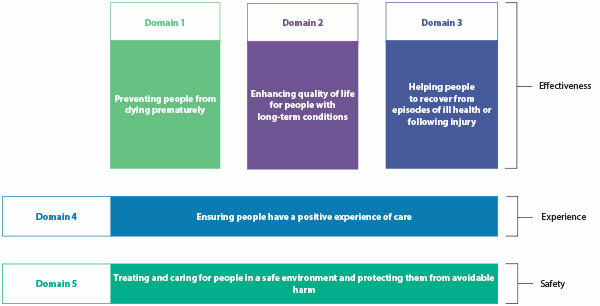 Joint Strategic Needs Assessments provide a broad review of healthcare and social care needs, including burdens of disease, local activity data, and inequalities in outcomes, and are an important resource for commissioners.14 These assessments are led by public health teams, which are now embedded in local government. Clinical commissioning groups are required to align their approach with the priorities for commissioning in local joint health and wellbeing strategies, which are set out by local health and wellbeing boards, hosted by local government, and include healthcare and social care commissioners. Benchmarking data is essential to assessing the relative success of local commissioning, while activity data allows the ongoing monitoring of performance. In addition to commissioning services to meet the needs of their population, commissioners must also ensure that these services are safe and appropriate. This includes ensuring appropriate clinical governance (such as processes to manage serious incidents) and the safeguarding of vulnerable children and adults. Commissioning is a complex task involving competing priorities and a wide variety of views. The learning curve is very steep and many clinicians are surprised by how long it takes to achieve changes. Learning patience and acknowledging that this is a new domain of learning are important for avoiding frustration. Copyright © 2013, re-used with the permission of The Health and Social Care Information Centre. All rights reserved. Rights as outlined in the NHS Constitution. Commissioning of the NHS must continue to focus on delivering the best value services for local populations and reducing inequalities in health outcomes. The continuing financial pressures mean that the rate of productivity and quality improvement needs to increase so that services can continue to meet the public’s high expectations. Commissioning is as much art as science, but both managerial expertise and clinical leadership are required to be successful. Organisation for Economic Co-operation and Development. Health care systems: getting more value for money. OECD economics department policy notes, No. 2. OECD, 2010. Coleman M, Forman D, Bryant H et al. Cancer survival in Australia, Canada, Denmark, Norway, Sweden, and the UK, 1995–2007 (the International Cancer Benchmarking Partnership): an analysis of population-based cancer registry data. Lancet 2011; 377 (9760): 127–138. to increase value and improve quality. London: NHS Right Care, 2010. Legislation.gov.uk website. Health and Social Care Act 2012. www.legislation.gov.uk/ukpga/2012/7/contents/enacted (accessed 1 February 2013). National Institute for Health and Care Excellence website. NICE quality standards topic library. www.nice.org.uk/guidance/qualitystandards/QualityStandardsLibrary.jsp (accessed 30 January 2013). NHS Information Centre for Health and Social Care website. www.ic.nhs.uk (accessed 30 January 2013). Porter M. Value-based healthcare delivery. Presented at Harvard Business School healthcare initiative: March 7, 2012: Harvard, MA.